When you think of space exploration we now days think of the romanticised Hollywood version of space travel. Unless you can think back to realistic movies like Apollo 13 it is easy to forget that it only takes a second for space exploration to become a nightmare for all involved. Sure we have sci-fi movies like Aliens that enhance the extra-terrestrial horror that many believe might be out there, somewhere, but very few films capture the horrors of the unknown and the impact it had on its first explorers like First Man does. Director Damian Chazelle (Whiplash, La La Land) doesn’t have to develop scary looking aliens in order to create horror for intrepid test pilot and engineer Neil Armstrong (Ryan Gosling – Drive, Blue Valentine) and his wife Janet (Claire Foy – Season Of The Witch, Vampire Academy). Like he did with Whiplash Chazelle just shows human life in its purest form… which for this family provided more horror than most couples could withstand. From the loss of their daughter which led to Armstrong joining the NASA Space Program in the first place, dangerous test missions that place Neil’s life in danger nearly every day through to the anguish that Janet endures on the days she knows that her husband is doing such tests. Chazelle just stirs the pot and lets the human emotions in the film bubble and boil until they explode. Neil and Janet’s solace come from their best friends Ed White (Jason Clarke – Zero Dark Thirty, Terminator Genisys), his wife Pat (Olivia Hamilton – Don’t Worry He Won’t Get Far On Foot, The Last Tycoon) and Neil’s immediate boss the caring yet determined Deke Slayton (Kyle Chandler – Friday Night Lights, Argo). Even so Pat and Janet’s ‘talking’ is normally disguised as children’s play dates, Neil seems happy to talk to Ed about the mission but pushes him away when the talk turns personal and while Deke does what he can to help his test pilots at the same time he is the man who has to make tough calls like switching off intercoms so wives can’t hear their husbands in peril and writing death announcements for missions he has to appear to be ‘confident’ for. 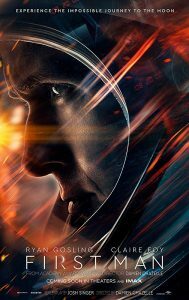 First Man could have easily suffered from Titanic-syndrome, a film where the audience knows the ultimate outcome and therefore just sits on the edge of their seat waiting for the expected finale but here Chazelle, who is aided brilliantly by his screenwriter Josh Singer (The West Wing, The Post), takes the audience on a different kind of journey. He captures moments they never told us about during our High School science classes. The raw, claustrophobic feel a test pilot feels as he hurled into orbit in what seems like a sardine can that they aren’t even sure will make the journey, the moments that wives find out that their husbands haven’t returned from a flight and the protests that occurred in America when the loss of life made people realise that these test pilots were really guinea pigs in what seemed like a cruel experiment. Then of course there is the tension an astronaut’s job puts on his family life and here we see painful moments such as the one where Janet has to plead with Neil to tell his children that he may not come back from his moon mission. Just like he did with Whiplash Chazelle also brings out the best in his cast and helps them bring their character’s pain and anguish to the fore. Claire Foy delivers her best role to date and if she doesn’t at least receive an Oscar nomination for this performance then something is seriously wrong. 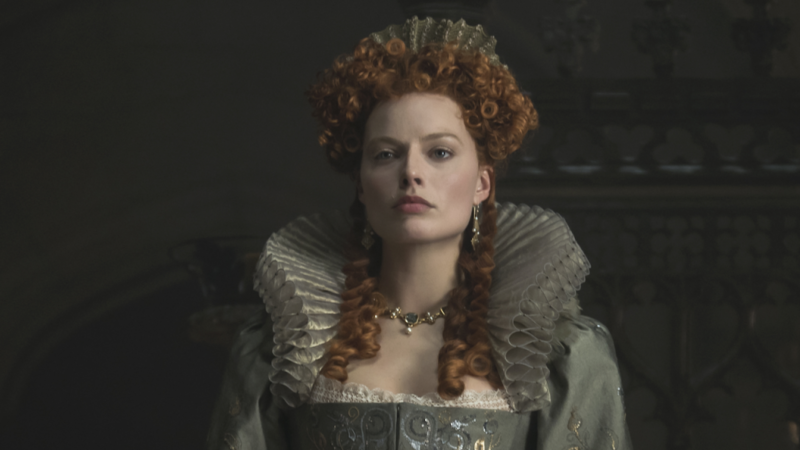 As an actress she delivers on every level as Janet is put through an emotional ringer and these are the kinds of performances that the Academy should be applauding – ones that test an actress and her acting abilities. Equally good is Ryan Gosling as Neil Armstrong. When cast as an All-American hero, a real life Captain America if you will, you wouldn’t expect an actor to have to become emotional dark and foreboding, but that is exactly what is expected of Gosling here. Forget his pretty boy looks because here Gosling calls on the acting skills that saw him create memorable characters in films like Drive or The Place Beyond The Pines… he is absolutely brilliant. First Man is the first film of 2018 that I have seen where my thought throughout was ‘this needs to be an Oscar film.’ From start to finish it felt like the film was taking me on a claustrophobic ride with its characters. The sequences in which the pilots are conducting test flights are moments of sheer cinematic masterpiece, where visuals and sound effects come together in a way that creates a horror that you never expected. This combined by outstanding dramatic acting performances from its leads and again I find myself putting the five stars down on a Damian Chazelle film. 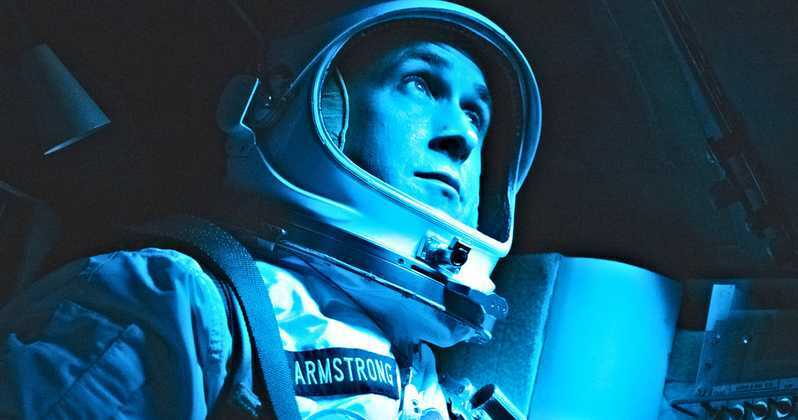 First Man is sheer brilliance, a lesson in dramatic filmmaking. Summary: As the worst opera singer in the world, Florence Foster Jenkins (Meryl Streep) prepares to take her career to dizzying new heights a young pianist, Cosme McMoon (Simon Helberg) finds himself swept up into the world of lies that Florence’s hsuband , St Clair Bayfield (Hugh Grant), has set up in order to protect her feelings. The world of cinema can be a strange, strange place. Whenever a film comes out I hear people talking about what demographic the film will appeal to, whether it will appeal to men or women etc. I’ve never really taken much notice of it because when it comes to films my tastes are pretty varied. While I love my horror and science-fiction I can also settle down and watch a movie meant for kids, like Monster’s Inc. and enjoy it as well. The same with movies meant for older people, take 45 Years for an example, while some said it was for older people I enjoyed it to the point where it has been one of my favourite films of this year. 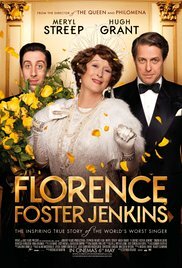 But now comes a film that is making me re-think whether some films are meant for different ages, and that film is Florence Foster Jenkins. Now I’m not going to sit here and say I hated the film because I didn’t. For me it was just a mediocre film, it didn’t bore me but it didn’t exactly have me labelling it a classic either. What did surprise me was the comedy aspect of the film. Sure the first couple of times Meryl Streep (The Devil Wears Prada) warbled horribly as Florence Foster Jenkins I chuckled, but there were some older members of the audience I was in who laughed themselves stupid every time Florence attempted to sing. Yes it really did have that kind of effect on the older audience. So why was Streep singing so badly off key? Because in this film she plays Florence Foster Jenkins, a real life character who during the 1940s made a name for herself for literally being a bad singer. And while anyone that every heard her would know she was a dreadful singer she was spared those details by the fact that her husband, St Clair Bayfield (Hugh Grant – Notting Hill) did everything in his power to make sure she never found out the truth. That included paying music critics and making sure anyone who ever laughed during her performances was quickly turfed out of the venue. During the film we see Florence start off at a small level of singing for small groups of people but as she plans to take her career even further, to the point of recording a single and performing on bigger stages, she decides to team up with a young piano player named Cosme McMoon (Simon Helberg – The Big Bang Theory) who quickly finds himself having to get used to St Clair and Florence’s web of lies. As far as the film goes despite being very light hearted in style in does get to you emotionally. Such is the power of director Stephen Frears (The Queen) and screenwriter Nicholas Martin’s (Midsomer Murders) style of filmmaking that many of the scenes of the ailing Florence really do start to get you, so much so that you do want her to be happy. That style of filmmaking also raises suspense at times when you wonder how some people will be react to Florence’s singing and how their reaction will affect her. It is those kinds of scenes that make this film well worth watching but there are also some downsides to Florence Foster Jenkins as well, and those largely centre around a huge issue in the casting. As you would expect from a film like this Meryl Streep puts in a brilliant emotionally driven performance and while Hugh Grant does match her remarkable well for me it felt like he was miscast in the role of Florence’s husband. While the wardrobe department have done all they can to ‘age’ Grant for the role it does come across as very creepy matching at times during the film… yes almost as creepy as the pairing of Catherine Zeta-Jones and Sean Connery in Entrapment. Having said that though Grant does put in a good and charming performance, he’s just in a role that he should never have been cast in. The other actor who really impresses in this film is Simon Helberg who most people will know as Howard Wolowitz on the successful comedy series The Big Bang Theory. Herlberg has shown throughout his television career that he has impeccable comedic timing and he certainly brings that to his character here – the socially awkward and very innocent McMoon. To his credit Helberg not only matches Streep and Grant’s performances but sometimes even manages to steal the limelight with his creative facial expressions. Maybe I didn’t find Florence Foster Jenkins as funny as some of the other people screening that I was in but I still found it a heartfelt film that grows on you the longer it goes on. You can hear Greg King’s full Florence Foster Jenkins review on The Good The Bad The Ugly Film Show Ep #175. Other Subculture Entertainment Florence Foster Jenkins reviews: You can also listen to our full Florence Foster Jenkins review on The Good The Bad The Ugly Film Show Ep #175. Summary: U.K. gay activists work to help miners during their lengthy strike of the National Union of Mineworkers in the summer of 1984. 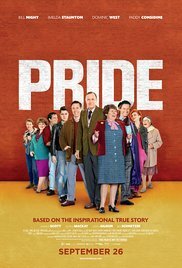 Pride is a film based in semi-recent history. The screenplay was written by Stephen Beresford and the film directed by Matthew Warchus. The story revolves around the miners’ strike in Britain in 1984 and the persecution the mineworkers suffered at the hands of the Thatcher government and the police. Contrasting this is the gay rights movement in London and one gay activist group’s plan to take action and help out another disaffected group of people by raising funds for the mineworkers and their families. The picture and the place-and-time are set instantly to recreate the Eighties and archive news footage shows us the situations going on with each of the main groups. To take us into this world we meet Joe (George MacKay), affectionately nicknamed “Bromley” after his hometown, on his twentieth birthday – which just happens to be gay pride day. Suddenly inspired to march he joins in with the gay pride activists, hoping to ‘blend in’. Instead, he gets thrust into the limelight, holding a sign for attention. He soon joins in gathering funds for the miners as established activist, Mark (Ben Schnetzer), takes up the cause. From there the LGSM (Lesbians and Gays Support the Miners) movement is born and we are thrust into the main story. On his journey, as is paralleled by the main plot, Joe finds his identity, new friendships, belonging and a cause. His awkwardness echoes the awkwardness between the two antithetical communities as they band together. Differing opinions within each group show the difficulty of the merger and of dealing with people’s uneducated phobias, but clever humour is used to lighten the tension and resolve issues in an entertaining fashion. A witty play on the stereotypes and expected ‘ignorance’ is used to effect to make things entertaining and take things out of predictable realms. The personal stories of some of our characters show us the effects that the mineworkers’ situation and the fight for gay rights have on those affected. These human insights give us an emotional connection and draw us further into the plot. We see the fight for survival, the AIDS epidemic – the character of Jonathan Blake was the second-diagnosed person with HIV in London, but is still living strong to this day – self-identity, coming-out and acceptance by your family and those you love. Gethin, our gay Welsh character, bridges the gap between the two worlds and adds a human expression with his feelings of being unable to return home after being rejected by his mother. As the two camps come together he is finally moved to take-part in the union and humour is used to make light of his awkwardness; breaking in a scene that shows how they are all growing comfortable with each other. The human element is at the core of the story. We follow this in Joe’s first-gay-steps, his first kiss, his outing to his family… Conversely, we see Maureen’s (Lisa Palfrey) bigotry and how this affects her actions to further her own agenda and to shield her sons from something she has misunderstood. We see the desperation of the mining families in a scene where two of the characters butter bread for sandwiches that have no other fillings. The clever humour is used to show a serious situation in a very accessible way. The story shows the characters at their best and worst and what they take from it all, making for a very engaging and powerful story. We see how the story gets turned around at the end and how far the two communities have come to support each other. We see the power that comes from people coming together; even if not all major battles are won, the amazing feats of people uniting under a common cause has the power to change things, even in small ways and this has a compounding effect. We even get to glimpse the ‘changed hearts’ of Maureen’s sons are they are there to support the gay community at the end, having overcome their own misinformed cynicisms. Exceptional performances from the whole cast brought the characters to life. Of note was Jessica Gunning as Sian who really ‘comes-out’ in her own right; taking what she has learnt to further herself and eventually became a member of parliament. Other Subculture Entertainment Reviews of ‘Pride′: For our full Pride review please check The Good The Bad The Ugly Film Show Ep #103. Summary: It should be one of the happiest days of Bernie Webber’s (Chris Pine) life. Becoming engaged to his girlfriend, the beautiful Miriam (Holliday Grainger), Bernie’s aim is to go to work at the Coast Guard station where he is stationed and go through the ritual of asking his boss, Daniel Cluff (Eric Bana), if he can get married. As fate would have it though one of the worst storms to ever hit the United States strikes on that very day. Offshore two oil tankers split in half and while the Coast Guard rushes to save the crew of one they have no idea that another is in difficultly until the alarm is raised much later. As Ray Sybert (Casey Affleck) battles to keep his crew alive Bernie finds himself being sent on a mission to rescue them, with a crew of his own –a crew that doesn’t trust him as his last rescue ended in the loss of life. Sometimes when a film is released you just have to shake your head at what the distributors think they are doing with the film. 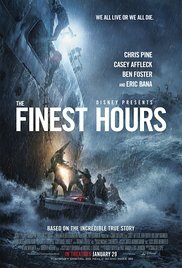 Disney’s choice to release The Finest Hours in Australia with no media screenings and only in limited cinemas is a baffling one. Traditionally, disaster films always do well in Australia and not only that The Finest Hours is certainly not the kind of film that should be kept away from the film loving public as it is a film that has a lot going for it. So often when a director and screenwriter team together to make a disaster film they fall into a familiar trap of trying to make the audience like the characters so much they pile a heap of back story into the film and the result is the disaster itself starting way too late into the film. That certainly isn’t a trap that Craig Gillespie and his team of screenwriters fall in to. Gillespie as a director is someone that certainly can’t be peg holed into a style of filmmaking. From the thought provoking Lars & The Real Girl through to the horror frights of Fright Night Gillespie seems to just make whatever film he damn well feels like and here with The Finest Hours he shows why he is a director that should be added to your list of ‘exciting directors in modern day filmmaking.’ He doesn’t muck around with tons of back story with The Finest Hours, instead the storm itself hits within the first half hour of the film, which means that Affleck and co and in peril before the ice in your Coke has even started to melt. Surprisingly The Finest Hours also manages to raise the stakes on a number of levels. Not only are the crew of the oil tanker in great peril but Gillespie also makes in known in no uncertain terms that Bernie is being sent on a mission that he has badly unprepared for with a boss that has no clue what he is doing… he is being sent to certain death. Just to raise the stakes even more Gillespie then has the events happen not only through the eyes of Bernie and Ray but also from the perspective of Miriam, an innocent bystander who is forced to watch as the man she loves is being sent on an impossible mission. It’s for that reason that The Finest Hours is a must see for those people that love good cinema. The suspense never lets up and Gillsepie masterfully directs intense scenes which sees Bernie’s small Coast Guard boat become a submarine as it plunges through the waves in front of it and the even more suspenseful scene during which Ray’s crew have to face the hard decision of whether or not to jump into the wild sea that has just claimed their tanker. The team of screenwriters also have done enough with the screenplay to make the key characters here likable. You instantly care what happens to the likes of Bernie and Ray, while they even steer well clear of making Mirian a whiny character, something that you feel a lesser team may have accidentally found themselves doing. The screenplay and Gillespie’s directional style also allows the cast to have a little bit of free reign as well. A look between Chris Pine and Ben Foster as their characters race towards the wild sea says more than one ten pages of script ever could. Likewise watching Casey Affleck sit in the corner and calmly think while the rest of his ‘crew’ panic says more about his character than any back story ever could. While both of done some great work in films over the years The Finest Hour is the one film that really shows that Affleck and Pine are so much more than what we have seen from them in the past. Through no fault of its own The Finest Hours is one of those films that is going to be overlooked by a lot of film goers simply because of the fact that it hasn’t been promoted properly. That’s sad when you realise that in a lot of ways this is a far superior film to something like The Perfect Storm… yes Craig Gillespie has somehow managed to create a classy disaster flick that demands a viewing by serious film lovers. Other Subculture Entertainment The Finest Hours reviews: You can listen to our full The Finest Hours review on a The Good The Bad The Ugly Film Show Ep #168. Summary: When America’s banks collapsed a few years ago the world was told a lie. The world was told that nobody, not even the top financial experts, saw it coming. That was only partially true, yes the top financial experts didn’t see it coming, but some men did. The Big Short tells the story of those men, men the world didn’t listen to. Michael Burry (Christian Bale) ran a small, but successful, financial firm and he saw the crash happening but due to the fact that he didn’t dress the way they did and liked to drum to Metallica in his office nobody really listened. The one person who did listen was Wall Street trader Jared Vennett (Ryan Gosling) who then went against the bank who he worked for and decided that this was a way to make money… betting against the bank. A misplaced phone call by him then tipped off Hedge Fund Manager Mark Baum (Steve Carrell) who then convinced Vennett to join him on his crusade against Wall Street. The chain then kept going as eager young investors Charlie Geller (John Magaro) and Jamie Shipley (Finn Wittrock) found a copy of Baum’s flyer and also decide that can make money off what is happening. Not experienced in making the trades they need to do to do so they rope in retired banker Ben Rickert (Brad Pitt) to help them out. When director Adam McKay set about making The Big Short he must have wondered whether or not he could pull off this project. McKay had established himself as a comedy director, a great comedy director to be precise… the man who brought us movies such as Anchorman and Step Brothers etc, but still it was ambitious to decide to make a comedy-drama about the collapse of America’s biggest banks. After all the minuet details of how and why the banks collapsed is so technical and boring it would not only go right over the head of the average cinema goer, but also have a strong chance of making them lapse into some kind of a coma if you bothered to explain it properly. Yes The Big Short was an uphill battle all the way but somehow McKay has made this into one of the films of the year. So how does McKay make this film work so well? The answer is simple. He does what so many filmmakers are scared of doing these days… and that is be creative. To put it into ‘banker speak’ he thought outside the box. Instead of having a series of long explanations of what exactly is happening with all the financial stuff McKay will allow the film’s story to pause for a moment while Margot Robbie (sitting in a bubble bath as herself) explains what is happening or he will cross to a celebrity chef comparing the market to bad fish. It sounds as strange as all hell… but it works and gets the point across in a way that the audience can understand without putting them asleep. That being said it isn’t creative ‘gimmicks’ like that which make The Big Short work so well. No McKay is aided by a screenplay that is simply one of the best screenplays to surface out of Hollywood for a long, long time. While it expertly reveals a lot of the greed and shame of Wall Street it is also about strong characters and consists of some of the wittiest one-liners you are ever likely to hear. To the credit of the screenplay you actually come to know and love these characters. You feel sorry for Mark Baum and the personal tragedy that he has suffered in his life while you find yourself barracking for the likes of Michael Burry who are putting everything on the line and copping abuse for doing so. Even though so of the characters are quite unlikable, such as Jared Vennett, the screenwriters have been smart enough to get them to deliver the quips that make people laugh in a bid to make them at least a little likable. Yes the unthinkable happens in this film, you actually like bankers. Of course that brilliant script also allows the actors involved to deliver some of the finest acting performances of the year. Steve Carrell showed us his serious side in Foxcatcher and here he once again revels in what is a demanding but emotional performance. If he takes an Oscar home for this performance he truly deserves it. Likewise Christian Bale who loses all of his Bruce Wayne good looks as he morphs into the hard rocking recluse Michael Burry so well that you forget who you are watching. The other true chameleon here is Brad Pitt who is completely unrecognisable as the bearded off-the-grid former banker Ben Rickert. These three lead an ensemble that makes this film truly memorable. Sure a film about the banking world might not exactly make you feel like you want to rush out and purchase tickets at the box office, but like Wall Street and The Wolf Of Wall Street before it The Big Short is a ground-breaking film that shows a completely different side to the filmmaking skills of Adam McKay. Creative, original and hard-hitting The Big Short is a film that I’m sure I’ll be revisiting when I put together my Top 10 Movies of 2016 list. 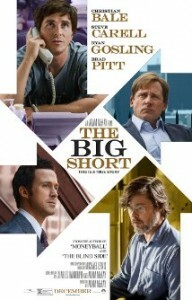 Other Subculture Entertainment The Big Short reviews: You can listen to our full Big Short Review review on a The Good The Bad The Ugly Film Show Ep #161. You can also read our The Big Short review on The Book The Film The T-Shirt. Summary: A portrait of a patron of the arts extraordinaire who transformed a modest fortune and impeccable taste into one of the premiere collections of twentieth century art. 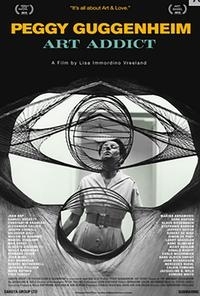 Other Subculture Entertainment Peggy Guggenheim: Art Addict reviews: You can listen to our full Peggy Guggenheim: Art Addict review on The Good The Bad The Ugly Film Show Ep #158. Summary: Orry-Kelly was Golden Age Hollywood’s most celebrated costume designer. Winner of three Academy Awards and responsible for the costumes of films as iconic as Some Like It Hot, Casablanca, An American in Paris, and Auntie Mame, Orry-Kelly was head of Warner Brothers costume department during the richest period of American film history. And he was born in Kiama, New South Wales. Acclaimed filmmaker Gillian Armstrong brings to life the tale of one of Australia’s undeservedly forgotten sons in her new documentary WOMEN HE’S UNDRESSED. The story of Orry-Kelly becomes one of discovery and intrigue, as Armstrong charts the trajectory of this most unusual and talented man. He was outrageous, witty, outspoken, a drinker, and uncompromising of his sexuality at a time when Hollywood was deeply conservative. 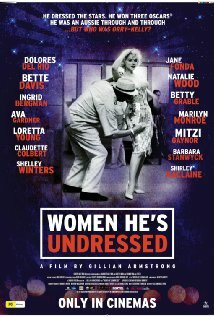 From costuming Hollywood’s most glamourous actresses, to a scandalous secret affair with one of film’s most famous and iconic actors, WOMEN HE’S UNDRESSED uncovers a rollercoaster of a life sure to fascinate, shock and illuminate. Other Subculture Entertainment Women He’s Undressed reviews: You can listen to our Women He’s Undressed review on The Good The Bad The Ugly Film Show Ep #138. Summary: A look inside the personal life of star Amy Winehouse. The film follows her from being discovered through to the dizzying heights of winning a Grammy Award to her tragic demise. Not being a fan of Amy Winehouse’s I wasn’t sure what to expect from the documentary Amy. The film had received rave reviews from right around but aside from knowing one of two of her big hits (namely Rehab) I actually didn’t know that much about her. Therefore the fact that this docco actually had me feeling somewhat emotional times really just goes to show how inside the life of his tragic star that director Asif Kapadia really goes… he doesn’t leave one single stone unturned. Kapadia announced himself as a seriously gifted documentary maker when he released Senna in 2010. The docco went so far into Senna’s life that even those film critics and fans who despised and knew nothing about Formula One racing were listing the film as a film that you had to see. Kapadia does the same here with Winehouse. He doesn’t sugar coat anything and instead shows the tragic life of a girl who was given an amazing vocal talent but probably would have much better off and happier if she reached the level of stardom that she did. 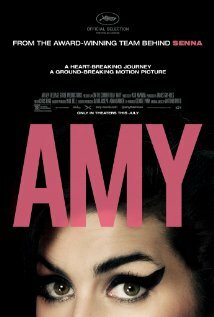 One of the best things about Amy is just how watchable Kapadia has made the film. Yes it runs for 128 minutes (some would argue overly long for a documentary) but so gripping is the story being told that you never once start to feel bored and start to think what coffee you might order after the credits roll. Kapadia allows Amy to start off like any music documentary chronicling a young star’s life would. There are the customary shots of her mucking around with her friends, singing at clubs in front of small crowds, but Kapadia also allows the audience to see more than that as he clearly shows that even at the age of nine Winehouse was already deeply troubled and the rollercoaster was just starting to take off. Like he did with Senna Kapadia breaks with normal traditional documentary filmmaking. There are virtually no talking head interviews here, instead the audience are treated to a lot of private home movies of Winehouse, her family and her friends that tell more about the star and her lifestyle than what any interview could ever do. Also making this a gripping watch is the fact that Kapadia doesn’t hold back when he is trying to tell his story. He doesn’t allow everybody in Amy Winehouse’s life come out of this smelling like roses. The audience watches as Winehouse’s life of destruction comes a lot worse with the arrival of her boyfriend (and then later husband) Blake Fielder-Civil on the scene – the film then basically points the finger as an expert eerily reveals that it was in Fielder-Civil’s best interest for his gravy train not to get sober again. Likewise Kapadia has the bravery to lump blame on Winehouse’s own father and he first reveals that Amy’s bulimia etc started when her father left the family home when she was just a child, how he was the main reason that she didn’t go into rehab when her managerial team was begging her to and how he brought film crews around and planned tours when all she wanted to do was rest and get herself well. It is a very brave documentary maker who is willing to tell a story with such brutal honesty. Kapadia’s alternative style of filmmaking also allows for him to let the documentary move along as he showcases the events in Amy’s life that was making her write the music she was writing. As handwritten lyrics appear across the screen the audience watches the life events unfold that sparked her to write the usually dark lyrics in the first place. Just as that similar kind of thing made Teen Spirit a must read if you are a fan of Kurt Cobain, this style here makes Amy a must see for Winehouse fans. I know having seen the film set out in this way I will never listen to the track Rehab in the same way again. There are times when you are watching Amy and it feels like you are watching car crash in slow motion. Instead of becoming a character study of one of the most successful young musicians of our generation the docco almost becomes a cautionary tale of what drugs, bulimia and super stardom can do to an ordinary person’s life. Kapadia’s brilliant style of story-making makes this the can kind of film that not only educates but washes over you with every emotion imaginable. One of the best music documentaries you will ever see. Other Subculture Entertainment Amy reviews: You can listen to our Amy review on The Good The Bad The Ugly Film Show Ep #167. You can also read our Amy review on The Book The Film The T-Shirt. 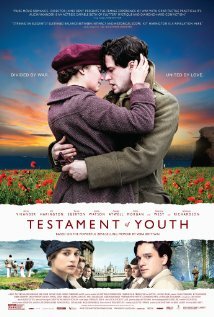 Summary: Based on the popular novel of the same name Testament Of Youth is a coming of age story that follows Vera Brittain (Alicia Vikander), a young girl growing up as England heads into World War I. Before the War Vera’s biggest problem is trying to get into university to study literature during a period when a woman’s studies were considered a waste of time. Upon getting into University though Vera learns that the war is beginning to spread across Europe. 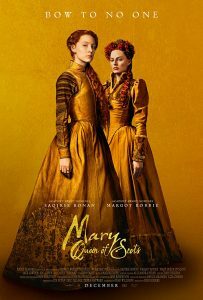 Soon she finds herself right in the middle of it as her brother, Edward (Taron Egerton), her fiancé Roland Leighton (Kit Harington) and best friends Geoffrey Thurlow (Jonathan Bailey) and Victor Richardson (Colin Morgan) are all sent off to Europe to serve. As the stories coming from the frontline get worse and worse Vera decides to put her studies on hold and instead become a volunteer nurse. Every now and then a film comes along that leaves you thinking ‘wow… just wow.’ In the time of special effects and CGI it’s normally been something epic happening on the screen that causes that response. Sadly, it is rarely a film that totally engrosses you in both its visual beauty and immersing storyline. But that is where Testament Of Youth comes to its fore… this is a film that will stick with its audience for a long, long time to come. While many films often lack the ‘feel’ of the novel they are based here screenwriter Juliette Towhidi (who recently also showed her skills on Love, Rosie) manages to capture all of the teenage angst and anger that the real Vera Brittain wrote in her autobiography. For once a screenwriter read the novel they were adapting and understood exactly what the writer was trying to get across to their audience. Testament Of Youth is anti-war but it is a film that is supposed to show how important it was that men did die during the conflict and also graphically depicts why war is such a nasty affair for the people left behind. What stands Testmant Of Youth apart from the many other films that have tried to show the horrors of war is the creative styling of director James Kent and veteran television director who is at the helm of his feature film. Kent brings a real beauty with this film working with his cinematographer in such a way that at times the images on the screen feel like you are looking at paintings. Even the most hardened emotionally draining scene seems to have an air of beauty around it with Kent in the director’s chair. Perhaps what shows his skills the most though is the fact that this is a film that is able to depict the horrors of war without ever actually showing a battle. The scenes of soldiers with limbs blown off or suffering from battle shock grouped together by something as simple as a father scouring the list of war dead in the newspaper does more than enough to show the audience how evil war can be without an overly graphic battle sequence. Having heaped praise on the film though it is only fair to warn cinema goers that Testament Of Youth is not a film that is going to be enjoyed by all. The film is slow in pace and if films like Atonement have had you snoring then it is likely you won’t be a fan of this film either. Still the positives of this film largely outweigh the negatives and the fact that this film delivers such a powerful message about subjects as deep as feminism and the horrors of war without ever feeling that it has become bogged down just shows how talented the team of filmmakers behind it really are. Also making Testament Of Youth a must see are the performances of its cast. Taron Egerton (who most would remember from Kingsmen: The Secret Service) and Kit Harington (yes Jon Snow from Game Of Thrones) put in such great performances that they are both virtually unrecognizable in their roles. Both show that they have the acting ability to go far beyond the roles that made them household names. But the strongest performance here comes from Alicia Vikander, an actress who has been on nearly everybody’s ‘star on the rise’ list since her performance in Anna Karenina. Her Vikander out performs her age and shows that she deserves to mentioned as one of the best young actresses in the industry at the moment. With Testament Of Youth she easily overcomes everything thrown at her and delivers a emotionally powerful performance that helps make this one of the films of the year. Next time somebody says that there are no great films made any more point them in the direction of Testament Of Youth. This powerful film delivers a strong message about war while also making the audience wish that James Kent had turned his hand to directing features a lot earlier in his career. The beauty of this film is hard to describe in words but it is enough to show that Kent is one director that has been underestimated over the years. Aided by some amazing cinematography and an outstanding acting performance by Alicia Vikander Kent has helped create a film that is worthy of five stars. Other Subculture Entertainment Testament Of Youth reviews: You will also be able to hear our Testament Of Youth review on The Good The Bad The Ugly Film Show Ep #126. You can also read our Testament Of Youth review on The Book The Film The T-Shirt.